Rookie running back Kenjon Barner from the University of Oregon (#25) catches a pass from quarterback Cam Newton (#1) at practice. Photo courtesy Carolina Panthers. SPARTANBURG, SC – After five days of training camp, Carolina Panthers’ rookie running back Kenjon Barner is learning a lot about the NFL…and, like the rest of the team, will finally get a 24-hour break as mandated by the new CBA. The 5’9″, 190-pound speedster from the University of Oregon is working hard every day on the job to be more versatile. With the help of not only his coaching staff, but also from fellow players, Barner is learning new tricks he will need to compete in the NFL. The Panthers’ veteran running backs are helping him as much as they can. “(Mike) Tolbert talks to me a lot, DeAngelo (Williams) talks to me a lot, T.D. (linebacker Thomas Davis) helps me. A lot of guys chip in and kind of help me give me different pointers about technique and where I need to be. It’s definitely a good feeling knowing I’ve got guys who are willing to help. “Now I’m tweaking my running, getting a little more physical than when I was at Oregon.” Barner knows being versatile will help him contribute to the Panthers. He hopes to continue to show his versatility by working not only at his natural running back position, but also as a kick returner. *Day five began at 9:20 a.m. and ended around 11:50 a.m. when placekicker Graham Gano split the uprights with a 50-yard field goal. The team erupted with cheers. The reason? His field goal meant the players did not have to attend evening meetings. If he missed, they would be stuck inside. The Panthers will resume their drills on Thursday. *Cam Newton threw two interceptions, and nearly a third, today. This was his worst practice of training camp. His first was picked off by cornerback Captain Munnerlyn, who returned it for a touchdown. The ball was intended to go to Armanti Edwards on an out route, but Munnerlyn broke in front of Edwards for the pick. *Several veteran players were given the day off today including wideout Steve Smith, center Ryan Kalil and defensive tackle Dwan Edwards. Cam Newton entering Gibbs Stadium without his trademark smile. He seems more serious about camp this season and wants to prove those who question his leadership that he is THE leader of the Panthers. SPARTANBURG, SC – The Carolina Panthers’ training camp is like every other NFL camp in that everyone feels they will not only compete, but win their division, conference and Super Bowl. As I pointed out in my last column (Friday, July 26), the Panthers have their issues…and after just the first weekend, they are addressing them quickly. Due to the emergence of second-year linebacker Luke Kuechly, Beason has moved to the weak-side linebacker position. Kuechly is a fan favorite after his outstanding rookie campaign. His plan, like Beason’s, is to be ready for Week One against Seattle, but only time will tell. 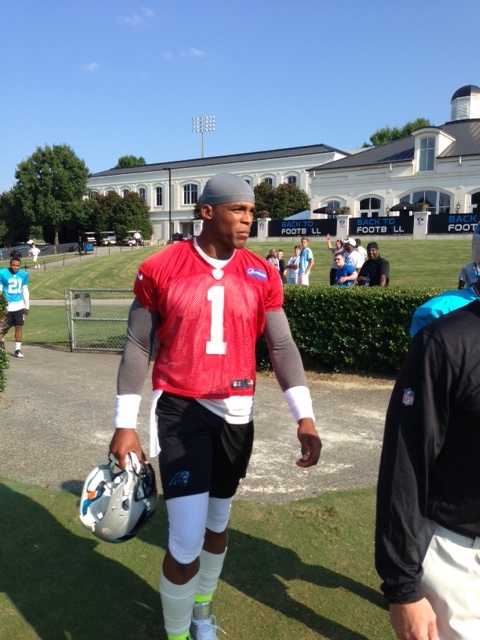 As for Cam Newton and his leadership questions, I noticed he was serious about his work over the weekend. Not as much smiling and joking around as in the past. If he can continue on the path he took in his last four games of the 2012-13 season, the Panthers’ QB will answer those leadership questions. His reaction to Atlanta Falcons’ quarterback Matt Ryan’s new $100 million contract: “I didn’t think anything. Good for him, but nothing more than that. The only thing that’s on my mind right now is a three-letter word. I think y’all know what that three-letter word is,” Newton said, referring to his desire to win. 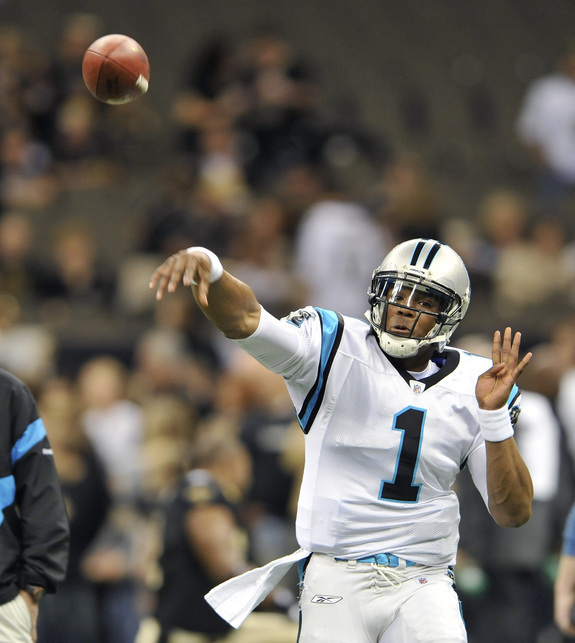 Newton signed a guaranteed four-year, $22 million deal in 2011 that includes a club option for a fifth year. The position battles have just begun in camp, and will continue for another four weeks. One thing you notice is how many wide-bodies the Panthers have in camp. These guys will take up space. Seeing first-round draft selection defensive tackle Star Lotulelei (6’2″, 315 lbs.) standing next to now-injured fourth-rounder, guard Edmund Kugbila (6’4″, 325 lbs.) standing next to free agent Linden Gaydosh (6’3″, 315 lbs.) and standing next to second-round selection, defensive tackle Kawann Short(6’3″, 310 lbs.) is impressive. Lotulelei could start while Kugbila needs to get healthy. * Local favorite, Brenton Bersin, a free agent from Wofford College, made a spectacular diving catch during Friday’s practice, which resulted in an eruption of noise from the fans. * One player I am rooting for to play a big role for the Panthers is Oregon running back Kenjon Barner (5’9″, 190 pounds). First of all, I am bigger than the speedy former Duck, and can look him in the eye. Seems like a nice kid. He is competing with a backfield that is heavy on veterans (DeAngelo Williams, Stewart and Mike Tolbert), but he has something special to offer. Anyone who watched Chip Kelly’s quick-paced offense saw Barner run and run fast. 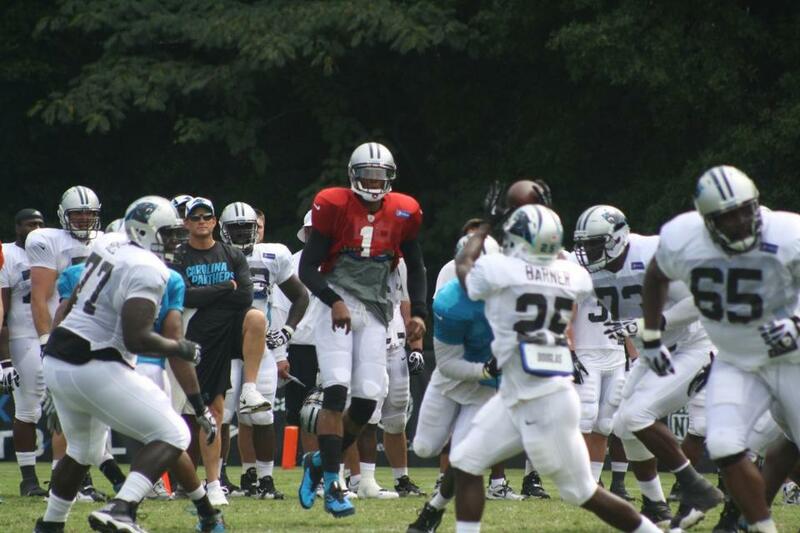 In camp on Friday, Panther coach Ron Rivera said, “He made a cut that was pretty impressive. Right now we haven’t put the things in that we feel will be really conducive to him, but we have seen his ability to catch the ball, his ability to put stress on linebackers when they’re in coverage and I do like his quickness. The biggest questions will be his protections, his ability to step up and block.” I am rooting for the kid to succeed! With the opening of training camp set for Friday, July 26, this year’s version of the Carolina Panthers has a lot of intrigue. This has been called a crucial season for Coach Ron Rivera (13-19 after two seasons). There are issues with leadership…issues with the running game…and issues with the offense to name three. For me, the biggest issue is what the Panthers will do on offense now that Mike Shula is the new coordinator. Rivera realized when former offensive coordinator Rob Chudzinski left for Cleveland, he had a tough decision to make. He interviewed two candidates with head-coaching experience – Pat Shurmur and Hue Jackson. In the end, he decided to stay in-house and promote Shula. Last season, Shula worked well with quarterback Cam Newton (as the quarterbacks coach), but he has not called plays since he was with Tampa Bay. New quarterbacks coach, Ken Dorsey, tutored Newton at IMG during the 2011 lockout and, as an advance scout for the Panthers, met with him each Monday during the season to discuss the upcoming opponent. The second issue I see as crucial is Cam Newton and his leadership abilities. Newton was the top overall draft selection in 2011, and while he has certainly been better than many critics felt he would be, he needs to mature. He did an adequate job with the read-option offense run last season, but Shula will be getting away from that. Too often last season, Newton’s body language was terrible. The conference is absolutely loaded with top-line quarterbacks, led by New Orleans’ Drew Brees and Atlanta’s Matt Ryan. If the Panthers are going to get over those two teams, Newton needs to not only be a better quarterback…make smart decisions…but show his teammates that one bad play is just not going to do anything to his confidence. Last year everyone saw him on the bench, sulking. Yes, I said it. I think he has all the ability in the world to be outstanding, but when he made a mistake (and he did…and will), deal with it and get your teammates back up. The third issue is see is the health of two players who could be keys for the success of the Panthers. Linebacker Jon Beason has already been shut down. He missed all but five games since signing a big contract extension two years ago. The Panthers plan to be very careful with Beason in preseason in order to be ready for Week 1 and the Seattle Seahawks. Running back Jonathan Stewart played nine games last year and underwent offseason surgery on both ankles. The Panthers have already announced he will be very limited in the preseason. I always enjoy going to camp to see the individual battles going on between players. Last year, it was the punter and placekicker battles that I enjoyed most. This year, there are several position battles to watch. More on that in my next report following Friday’s opening of camp at Wofford College in Spartanburg, SC. What Are You Searching For? Search SportsView! Buy My Book! NOW AVAILABLE! Click on the Buy My Book link on the top of this page!